Grosse IIe is an island and township in Wayne County, Michigan that sits along the Detroit River between the very close mainlands of the United States and Canada. The island is 9.6 square miles, had 10,894 residents in 2000, and is also comprised of 8.7 miles of inland waters, e.g. rivers, marinas, etc. 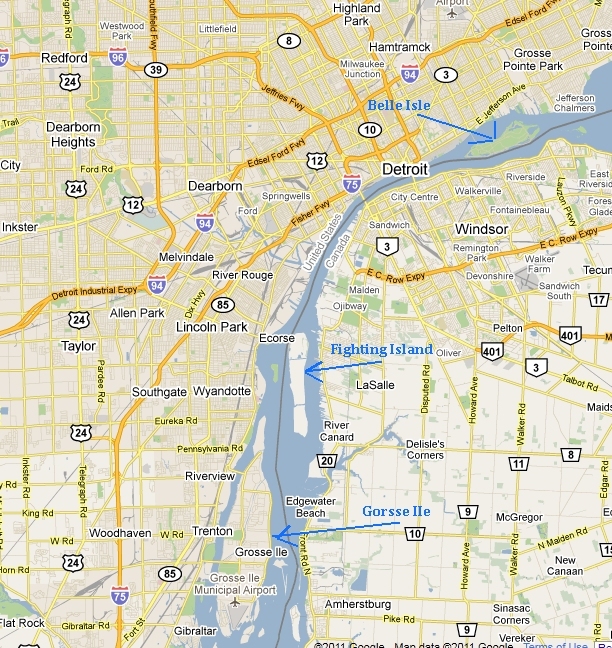 Grosse Ile is the largest island on the Detroit River. Grosse Ile is actually composed of twelve islands although the community is most often identified with the "main island" (which residents simply refer to as "The Island"). Grosse Ile's "main island" is technically composed of two islands. Two bridges connect the "main island" to the mainland of Michigan. The bridge on the north end of the island is called the Grosse Ile Toll Bridge (off-white color). The bridge on the south end of the island is officially named the Wayne County Bridge (light green in color), but is commonly called the "Free Bridge" by locals. Over the years, Grosse IIe has been home to many famous inventors and influential executives in the automotive industry, including Ransom Olds, founder of Oldsmobile, William FIsher, founder of Fisher Body that later become a division of GM, General William Knudsen, president of GM from 1937 to 1940, Henry Ford (just bought land there he later sold to Ford employees), John Karmazin, Dr. who invented the automotive radiator pressure cap, to name a few. I enjoyed biking Grosse IIe, but that may simply be because I enjoy biking different locations all the time. I started by biking around the perimeter of the island which is nice because it gives you a constant, beautiful view of the Detroit river, the beautiful waterfront homes, the boats docked on the island as well as in the waters, and the mainlands. You'll pass many others enjoying the beautiful scenery biking, walking, and jogging. However, there are no real bike paths around the perimeter island, just a narrow shoulder to the road, so you have to be more concerned about traffic. After biking the perimeter of the island, I moved to biking inland. This was also very nice and easier as there was less traffic. As you see in the photos, there are many nice neighborhoods in the inside of the island that you bike through, appeciating the houses, nicely trees streets and, my favorite, many inland canals to bike over and around. Also inside the island is a nice small, one street business district you can bike that has all the conveniences of a bigger city in it, e.g. banks, shopping, restaruants, etc. Inside the island is also a nice stretch of dedicated, baved bike paths, an air field, marina, and several golf clubs.